Our Force Plate uses a strain gauge and features excellent linearity and temperature characteristics, allowing calibration with a static load. Minimal zero-drifting enables stable measurement. Our unique technology is applied to the design and combinations of the internal sensors and top plates, which are the key features of Force Plate. Digital measurement available by simply connecting a Force Plate to a computer via remote control. Analog signal includes 6 force components. Data can be easily acquired through A/D input, which allows easy coordination with motion analysis systems. Multiple Force Plates can be regulated using a remote control (zero-adjustment, range settings). Three measurement ranges are available according to test purposes. An accurate level adjustment is required; Force Plate must be installed on the level; integrated sensors are to receive load equally. 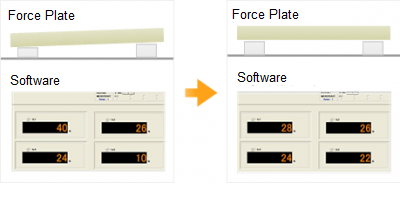 With the software, these installation adjustments can be easily performed by applying load at the center of the Force Plate while checking the load values of corner sensors. * A level meter helps to make the surface of Force Plate horizontal. However, it is also necessary to adjust an installed ground level to the floor. * Level adjustment while monitoring actual load is a very accurate method generally applied to industrial equipment such as load meter installation of a large tanker. Transparent Glass Top Model. 39mm thickness tempered glass is used for the top plate. Low capacity Force Plate (Max. range 1kN, Min. range 300N). Suitable for measurement of a small force such as a child's standing-up motion. Large model suitable for a measurement of larger step movements such as those in sports. Extra-large model for the use in an athletics stadium. Applicable for both single use and a measurement system using multiple Force Plates.